Valentine’s Day is coming up. Some couples pick that day to get married. It may seem like a good idea. But you may want to rethink it. Economists at the University of Melbourne tracked a million couples. They found that 11% of the people who got married on Valentine’s Day were divorced after five years and 21% were divorced after nine years. This compared unfavorably to couples who were married on ordinary dates. Other holidays and special number dates like January 2nd, 2003 (1/2/03) also resulted in higher divorce rates. A study at the University of Washington found that divorce filings peaked in March and August. Trying to explain this phenomenon, Associate Professor Julie Brines said these months follow winter and summer family holidays. Troubled couples may believe they can fix their relationships with a happy holiday or vacation, but in reality these times can bring even more stress and disappointment to the participants. Couples with children may want to start a divorce before the new school year starts. Lawyers know that the Season of Joy is followed by the Season of Divorce. There are more separations and divorce filings between January and March of each year. “People somehow expect the joy of the season is going to correct a troubled marriage and it never does,” Ginita Wall, who runs a divorce workshop, told NBC. Guest Post by Donna Swanson, a legal blogger for the Law Offices of Daniel Jensen. For many families, the holidays tend to center around families and friends. From Thanksgiving through the New Year, many people make a special effort to see their loved ones and spend time with their family. This often manifests as traveling to visit family and going through familiar family traditions. While this can be extremely exciting for many, it can be, unfortunately, particularly difficult for those going through a divorce or learning how to cope after a recent divorce. In a divorce, a person not only separates their life from their previous spouse, but also that person’s family and friends. For some, this is not as much of an issue; however, for other people, trying to figure out what to do and how to cope without these traditions and people can be especially hard. Although it does get easier as more time passes, there are certain ways that a person can prepare him or herself so that the holidays are not as difficult. Start new traditions – the holidays are rife with traditions. From choosing a Christmas tree to cooking Christmas dinner, people tend to do the same activities year to year and place significant value on these. While many of these can continue after divorce, some cannot. As such, coming up with new traditions that replace some of these old traditions cannot only help you solidify the fact that you are starting a new life, but also help you avoid focusing on the old traditions. Make plans in advance – the holidays typically require a great deal of planning to make things work between family and friends. This can be exaggerated when you are divorced, particularly if you have children with your ex-spouse. In order to minimize the effects this has on you and your family, not to mention avoiding unnecessary frustration and anxiety, it is usually best to plan out as many activities, traveling, and custody plans with your ex-spouse as possible. Take your mind off things- whether it is scheduling more dinners and outings with your friends or working with charities, seeing people and enjoying different activities can help you from dwelling on negative thoughts and feelings. These tips can help you ensure that you are taking all necessary steps and allow you to focus on things to make your holiday season a happier one. Custody battles can get pretty ugly. People do and say things they normally wouldn’t because the stakes are the highest they can be, namely, the children. Father’s rights and mother’s rights are often pitted against each other. But the highest correlation to a child’s stability and well-being after a divorce is the health of the parent’s relationship. So let’s call a truce to hostilities until the New Year. Put aside your disputes and differences for the sake of the children and let them have a conflict free holiday season. The best holiday gift you can give them is to let them know they are loved by their mothers and fathers. Halloween is the most important holiday of the year for many children according to Donna at SingleParentGossip.Com. But children of divorced parents have many questions, like which parent will take me trick or treating? The easiest answer is to look at the Parenting Agreement, but sometimes Halloween is overlooked as a holiday in the vacation schedule. Then the children are with the parent who has them in the regular weekly schedule. That means one parent may be left out when it is time to trick or treat. You may be close enough so that the children can trick or treat with each parent. Or you may be able to reach an agreement to alternate Halloweens. Some parents can work together so that one stays at home and hands out the candy and the other goes with the children. Then they alternate the next year. Children want to know where they will be going to trick or treat. The children may be comfortable and used to one neighborhood. They may traditionally trick or treat with their friends in that neighborhood. So it may take them some time to get to know the kids in the other parent’s neighborhood. Who picks the costumes? If there is a dispute, let the parent who picked the costumes in the past continue to do so. Take enough pictures of the children in costumes so that each parent can have some. If possible, have a picture of the children with each parent. Most of all remember that Halloween is the children’s holiday, not the parent’s. 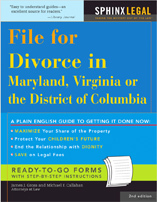 January is usually the month when the most divorces are filed during the year. “It may be because the holidays are over or that people want a fresh start at the New Year,” says Dr. Barton Goldsmith, a family therapist in California. Some people want to get through the holidays with a minimum of disruption to the families. Others are hoping their partner will change. When nothing happens at the end of the old year or start of the new year, they view divorce as the solution. Dr. Goldsmith has good advice on breaking the news to the children, gently and slowly. He also tells you not to beat yourself up too much with would-a, could-a and should-a during the difficult divorce process. “There may not be a perfect moment,” he says. If you have tried counseling, communicating, and compromising, divorce may be your next best option. Holidays can be depressing or stressful if you are alone because of the emphasis on families and being together. But don’t worry. The folks at PsychCentral.Com have put together this helpful list of ten things to do if you are alone for the holidays.